At ValuedVoice we are always thinking about new ways to help our influencers earn more money with us. After receiving feedback from numerous influencers and brands, we have decided to introduce a new type of job called Limited Time Offers or LTO’s. 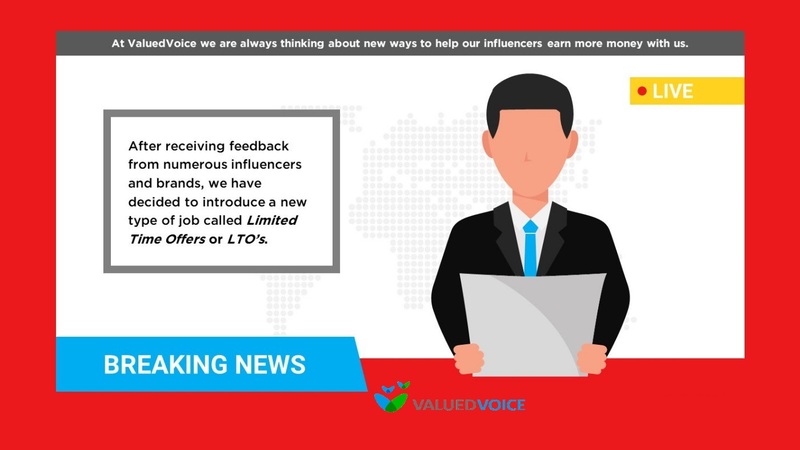 LTO’s are open job opportunities that will be available to a pool of influencers that meet the Brand’s requirements and will expire as soon as the required number of influencers needed for the job has been met. This is a great opportunity for anyone that is looking to earn more money with us! When you receive an LTO, make sure to review the Job Description, Brand Guidelines, Price Offered, and Content Provided (if applicable) before accepting. Job Description – instructions provided by the brand breaking down exactly what they want you to do. Brand Guidelines – if provided, this will give you a peek into the brand’s mission, product line, industry, etc. Price Offered – this is the price the brand is willing to pay influencers to complete the job. Keep in mind, the price may be lower than the price you have set in your account, but as mentioned, it’s completely up to you if you want to accept. Content Provided – if there is content provided for the job, you will be able to see a snapshot of the possible article to give you a better gauge on whether it is a fit for you. As always, the content you receive will be unique, and will not be given to any other influencers. Lastly, we aren’t changing our old system. We will still be sending you direct jobs at the rates you have in your account.This is just another way to make money with us. It will take some time to build up a good base of offers going out from our brands, but you can expect to start seeing LTO’s as early as this week. This is a very exciting time at ValuedVoice, and we hope you really enjoy this new type of service. As always, if you have any questions, don’t hesitate to reach out to our support team.